Lead-free Solder Paste, zerolead, no-lead solder paste, no-clean, rohs. Ship Fresh! The Brand Name Says It All: ZeroLead® Solder Paste is your RoHS Compliant, Lead-Free solder paste perfectly harmonizing its rich tin, silver and copper alloy with an effective no-clean flux 'carrier', superb wetting characteristics and premium solder joints with a nice satin finish! ZeroLead® Solder Paste was developed specifically for your PCB bench and for rework and low volume prototyping. Six-Month Shelf Life! No Refrigeration Required! 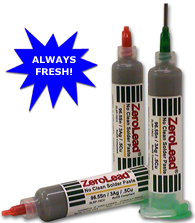 Our ZeroLead® is a premium quality, low residue, no-clean paste with a flux/sphere ratio making it ideal for the bench. It has a 6-month shelf life without refrigeration. VOC-free and halide-free, ZeroLead® Solder Paste meets or exceeds Bellcore specs. (We also have classic tin/lead solder paste with the same shelf life). Premium Formulations 'Stays Put' on Pads: With virtually homogeneous properties, you'll appreciate how the ZeroLead® Solder Paste "stays put" after dispensed onto your pads...and perhaps, best of all is its remarkable attribute towards Zero Balling during solder reflow. And our 96.5Sn, 3.5Ag and 0.5 Cu alloy is RoHS lead-free! Each Order Ships From Our Factory "On Ice". Even with its 6-month shelf life without refrigeration, we still go even an extra step and ship your excellent ZeroLead® Solder Paste filled into convenient 10cc syringes to you packed "on ice". Why? So you are getting the freshest paste possible from us. How about that?! And every order ships out with your SDS docs, too. What does it mean to be RoHS Compliant and what is RoHS? The European Union has restricted tin/lead solders by the E.U. 's RoHS Directive #2002-95-EC. Not to worry because our ZeroLead® Solder Paste is RoHS Certified. Zephyrtronics was one of the first to market lead-free solder to the world in the 1990's. While lead-free solders have slightly higher melt points than traditional tin/lead alloys, it's still just easy to solder your PCB work as before. See the proof: "Lead-Free Mandate: Soldering & Its Impact on PCB Manufacturing with Case Studies & Thermal Profiles"
2.) Solder pastes used in high volume production have very short shelf lives due to high flux/sphere ratios needed in conveyor ovens. Such pastes require refrigeration. Zephyrtronics Pioneered Using Solder Paste at the Bench. We solved all of those problems. We did it first and we did it best. We recognized the obvious -- the superior quality of solder joints made with solder paste over those made with solder wire, especially with SMD chips. And then we went to work to bring you our ZephPaste™. in 10cc syringes. Click for More Details. Reduced Defects for High Reliability Assy's. 6-Month Shelf Life, No Refrigeration, No-Clean Formulation! Nearly twenty years ago, we developed our unique flux/sphere ratio that does NOT REQUIRE REFRIGERATION. It was specifically targeted for the electronic bench and to synergistically with non-contact hot air pencils and a preheated PCB assembly. The results were nothing short of perfection...and a real hit with engineers, technicians and quality personnel. See the video. Production Quality Soldering Right at the Bench! Our proprietary ZeroLead® Solder Paste is the result of years of research and extensive laboratory and field testing. It's really quite a simple proposition: with the right solder paste, your thermal profiles at the bench can reflect those successfully achieved with high-volume production ovens, and yield high-quality solder joints replete with shiny fillets on the toes, heels, and sides of the component's leads at the pad interface. ZeroLead® is a tin, silver and copper alloy. It is a low residue, no clean paste with a flux/sphere ratio that makes it ideal for the bench. It is VOC free, Halide free, Non-hygroscopic, meets or exceeds Bellcore specs, IPC and J-Standards. (See specs in chart at left). ZeroLead® Solder Paste is the same solder paste that Zephyrtronics has demonstrated at electronic trade expos from Massachusetts to Munich delighting engineers and quality personnel. It is the solder paste recommended with the award winning ZT-1 Preheating AirBaths and the ZT-2 Hot Air Pencil for non-contact solder reflow. Order Securely Here On-Line: Extra long shelf life! No refrigeration! Great no-clean properties! And we ship it out to you on ice! (Actually it's a cold pack, not because it needs to be refrigerated, but just because we want it to get to as fresh as possible from our factory. . Ships with SDS. Always Fresh. Ships "On Ice"
©1996 - 2011, 2012, 2013, 2014, 2015, 2016, 2017, 2018, 2019 by Zephyrtronics®. All rights reserved. The information, text, images, photographs, charts, graphs you receive online from Zephyrtronics® are protected by the copyright laws of the United States. The copyright laws prohibit any copying, redistributing, retransmitting, or repurposing of any copyright-protected material. Zephyrtronics is the registered trademark property of JTI, Inc. "The Science of Zephyrtronics" and "Simplicity Through Innovation" and "Zephlux" and "Zero Balling" and "Zero Residue" and "Post Cooling" and "Post Cooler" and "AirBath" and "SolderGlide" and "SolderMill" and "Just So Superior" are the protected trademark property of JTI, Inc. "Zephyrtronics" and "Low Melt" and "ZeroLead" and "Air Fountain" and "Fountainhead" are the registered trademark properties of JTI Inc. *Above names are the registered property of their respective owners.